Enjoy an English course in Toronto, an incredibly modern and varied city with a spectacular setting. Canada’s largest city sits on the perfectly blue Lake Ontario, gazing across to the famous Niagara Falls and the US border. The CN Tower grants you magnificent panoramas of the city’s skyscrapers, its abundant green spaces, and its impressive sports stadia. Spectator sports are hugely popular here, so why not go along to an ice hockey or baseball game to see what makes the locals tick? Toronto is one of the most diverse places on Earth, with cuisine to reflect its melting pot of cultures. Little Italy, Koreatown, Greektown, Little India, and Chinatown all boast countless eateries for post-lesson snacks or fine dining – there’s something for every budget! 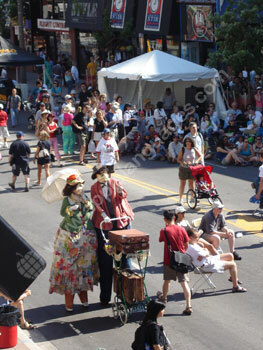 It’s this diversity that has given the city its thriving art scene, a busy cultural calendar, and colourful markets. Toronto is a paradise for shoppers, offering a fantastic array of vintage boutiques right next to massive shopping malls. You’ll be spoilt for choice for things to see and do after your English lessons in Toronto! 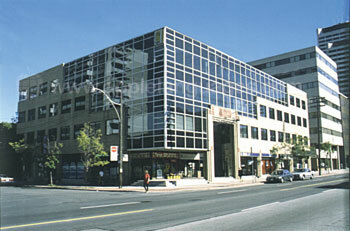 Our English language school is located in the Midtown district, within easy reach of the heart of the city. Eglinton metro station is only two blocks away from our school, giving you the opportunity to explore the outer reaches of the city after class. Midtown is characteristic of the city as a whole, with plenty of shops, restaurants, and lush parks all nearby. In addition to bright, spacious classrooms, the modern school building has a student lounge, a multimedia centre, and an Internet café with lots of computers and a plasma TV. 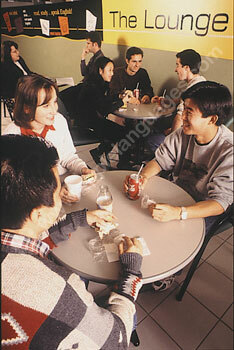 You can learn English in Toronto in same-level groups, on a programme of one-to-one lessons, or with a combination of the two. Our school’s teachers are all highly-trained, patient, and enthusiastic, so you’ll receive the best tuition possible! Group courses of 20, 24, or 30 English lessons per week are available, giving you the chance to meet lots of other students and practice your English skills with your peers. If you’re the sort of student who often finds themselves steaming ahead or lagging behind in group classes, our private course would be perfect for you. Individual tuition allows our school’s expert teachers to focus on areas of the language you enjoy studying or need more time on, so your skills will quickly develop! 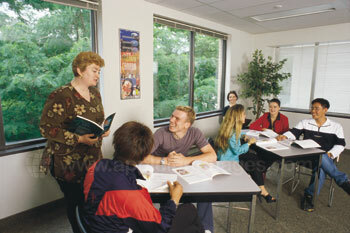 The school also runs Academic Year courses, allowing you to study for 28, 32, or 36 weeks at a reduced cost. See more of Canada and return home fluent in English! 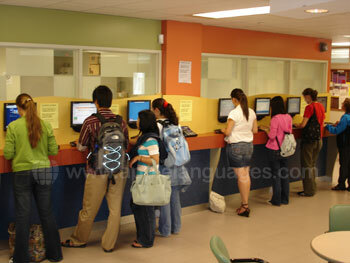 Please feel free to contact us with any questions you may have about taking English lessons in Toronto. Homestay lodging is a great way to advance your language skills and experience the local way of life! Chat with your friendly English-speaking family in your free time, putting the vocabulary you've learnt to good use and learning local words and phrases. Every day you'll eat breakfast and dinner with your family, which is included in the cost of your course package. Alternatively, you can enjoy a little more independence by staying in a shared apartment with other students at the school. You will have your own private room and share bathroom and kitchen facilities with the other apartment residents (private bathrooms may be available on request, subject to availability). This type of lodging is offered on a self-catering basis and is conveniently located in Old Toronto, close to shops, cafés and restaurants, and many of Toronto's main sights! Our school's packed activity programme will make sure you have a great time as you learn English. These are conducted in English, designed to be fun and informative, and can include: tours around Downtown Toronto, shopping trips, sports games, museum trips, white-water rafting, and theatre nights. As well as supplementing your classroom learning, the activity programme will also help you get to know your fellow students. Excursions are organised for the weekends, taking you to nearby sights in Canada and perhaps even across the border to the USA. Popular destinations for excursions include Niagara Falls, Algonquin Park, Montreal, Québec City, Ottawa, New York, Boston, and Chicago, to name but a few! Toronto Pearson International Airport is the main commercial airport in the city and Canada's largest. Services fly here from all over the world. We can arrange a transfer service on arrival and/or departure at this airport for an additional fee.